People are worried about their jobs being taken over by robots. 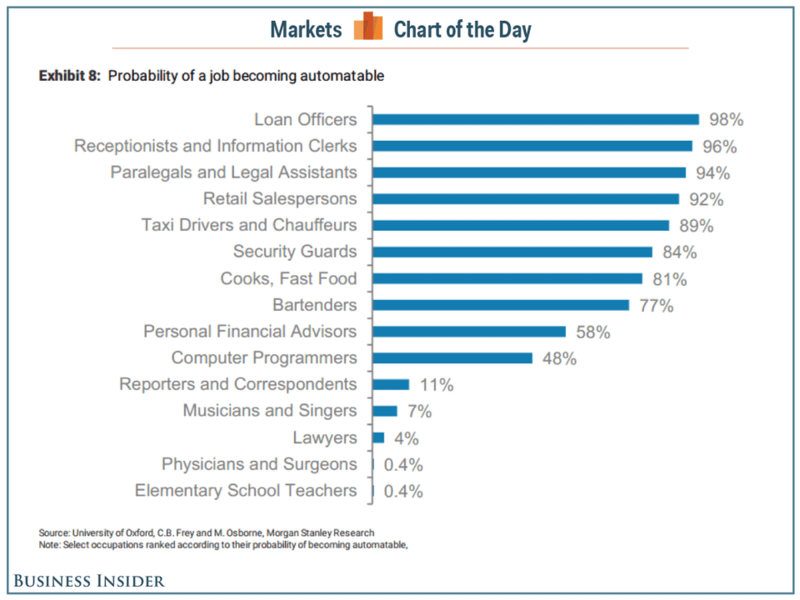 And so, in a recent note to clients, a Morgan Stanley team led by Elga Bartsch included a chart showing the probability of various jobs becoming automatable. They used data from a recent study by Carl Benedikt Frey and Michael A. Osborne, which found that about 47% of total US employment is at risk of being replaced by machines over the next two decades. "A material shift in the composition of the labour force would result as demand for low skilled labour remains robust as many personal in-person services are not yet replaceable by machines," according to the Morgan Stanley team. "Hence, the bifurcation in productivity of the workforce to low and high-skilled could be weighing on average productivity growth." The Morgan Stanley selected 15 various jobs for their chart, but if you want to see more head over to Frey and Osborne's report.